The Engine Room is suitable for a maximum of 8 person (16 years and older). Combine a visit to The Engine Room with Splashtours. Step into the amphibious before or after playing the escape room. After a city tour you dive with bus into the river. Suddenly the bus turns into a seaworthy vessel, sailing down the river with spectacular views of the city skyline! 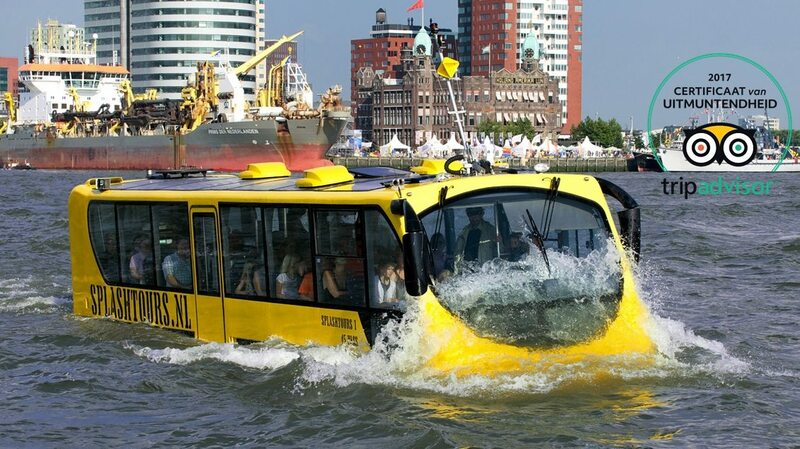 The amphibious bus leaves in front of Escaping Rotterdam . The Splashtours tour of the city will take you to the most exceptional and beautiful places in Rotterdam, followed by the “splash”: a spectacular dive into the Maas River. Suddenly the bus turns into a seaworthy vessel, sailing down the river with spectacular views of the city skyline! The Splashtours Rotterdam city tour lasts about 60 minutes. We advise you to book your ticket online. In this case you will know for sure that the escape room is reserved for you. Parkhaven 9, opposite the Euromast (Navigational address: Parkhaven 20). At the schip ‘De Zwarte Zwaan’ you’ll find our lasertag arena and the escape room of Escaping Rotterdam. For more information about our location check the ‘Location and parking‘ page.